Home » CENTRIFUGAL PUMPS , CENTRIFUGAL PUMPS In Detail , CENTRIFUGAL PUMPS In Detail By P.K.Nagarajan » CENTRIFUGAL PUMPS In Detail By P.K.Nagarajan Sr.Lecturer University. CENTRIFUGAL PUMPS In Detail By P.K.Nagarajan Sr.Lecturer University. Download The Lecture Notes: Click Here. Centrifugal pumps, are a sub-class of dynamic axisymmetric work-absorbing turbomachinery. 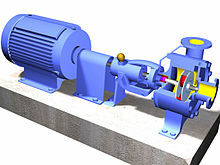 Centrifugal pumps are used to transport liquids/fluids by the conversion of the rotational kinetic energy to the hydro dynamics energy of the liquid flow. The rotational energy typically comes from an engine or electric motor or turbine. In the typical simple case, the fluid enters the pump impeller along or near to the rotating axis and is accelerated by the impeller, flowing radially outward into a diffuser or volute chamber (casing), from where it exits. The outlet pressure is a reflection of the pressure that applies the centripetal force that curves the path of the water to move circularly inside the pump. On the other hand, the statement that the "outward force generated within the wheel is to be understood as being produced entirely by the medium of centrifugal force" is best understood in terms of centrifugal force as a fictional force in the frame of reference of the rotating impeller; the actual forces on the water are inward, or centripetal, since that's the direction of force need to make the water move in circles. This force is supplied by a pressure gradient that is set up by the rotation, where the pressure at the outside, at the wall of the volute, can be taken as a reactive centrifugal force. This was typical of nineteenth and early twentieth century writings, mixing the concepts of centrifugal force in informal descriptions of effects, such as those in the centrifugal pump. Differing concepts and explanations of how centrifugal pumps work have long engendered controversy and criticism. For example, the American Expert Commission sent to the Vienna Exposition in 1873 issued a report that included observations that "they are misnamed centrifugal, because they do not operate by centrifugal force at all; they operate by pressure the same as a turbine water wheel; when people understand their method of operating we may expect much improvement." John Richards, editor of the San Francisco-based journal Industry, also downplayed the significance of centrifugal force in his in-depth essay. "This extraordinary report stands printed in a Government publication, signed by men who were, or are, eminent in mechanics, and we can only deplore the stupidity, as well as presumption of the commission who thus disposed of a subject that had twenty years before been carefully investigated by such men as Sir John Rennie, Professor Cowper, Mr. Whitelaw, Dr. James Black, Professor Rankine, and many others. The most astonishing part is, however, that this report was passed and signed by men who we can hardly suppose would fail to perceive its absurdity." The head added by the pump ( ) is a sum of the static lift, the head loss due to friction and any losses due to valves or pipe bends all expressed in metres of fluid. Power is more commonly expressed as kilowatts (103 W, kW) or horsepower (kW = hp*0.746). The value for the pump efficiency, , may be stated for the pump itself or as a combined efficiency of the pump and motor system.